Last edited by neilus; 04-15-2019 at 03:52 AM. With cantilever installed why haven't they nixed the old shock towers, should they not be redundant then. That should make it possible to move things in 3 mm or so. they are only needed for the stock body posts, which i assume you won't use with a flatbed setup where this setup is normally used. Yeah i read that flatbed part on the listing at RC mart, but you sure as hell are not going to fit on a deep flat bed with those posts there. Then i think i would be tempted to widen the frame rails in the back some how or make double frame rails, so i could get the shocks on the inside of the outer rail and maybe outboard the connection point for the lower push rod to the portal housing. 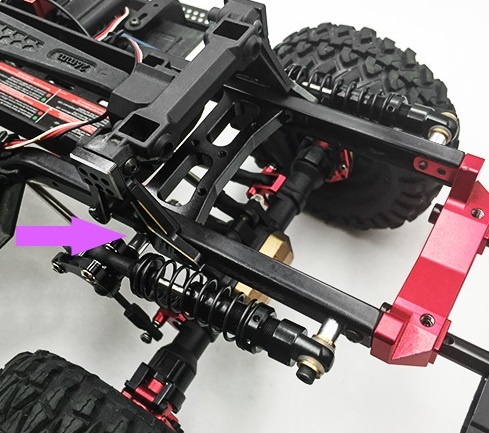 I could see using this suspension if you were building a caged rear truggy. Otherwise I don't see the need for a cantilever setup.